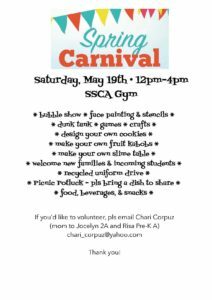 Home » News » Spring Carnival! Pre-sale tickets are available in the attached form. If you are interested in helping out, please reach out to Chari Corpuz at chari_corpuz@yahoo.com. We still need donations of juice and water for drinks at the event – if you’d like to donate please bring to the front office. « Previous: Buy Tickets to the Auction!